Pat O'Brien was a skinny South Dakota kid with long hair, a rock and roll band, divorced parents and an alcoholic father. In all the familiar ways, he was on the road to nowhere until a professor, who envisioned his future as the household name he would soon become, dramatically changed his life. From that day forward Pat's life took turns that were both spectacular and destructive: from the Huntley-Brinkley Report and afternoons at Bobby Kennedy's living room with Muhammad Ali to conversations with six Presidents. He did acid with Timothy Leary, drank with Mickey Mantle, and over the course of a remarkable career up close and personal with the Beatles, The Stones, The Kennedy's, Magic Johnson, Michael Jordan, Tiger Woods and virtually every star in Hollywood. 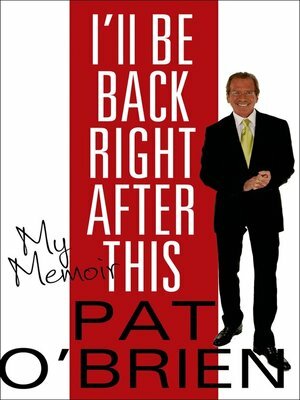 In I'LL BE BACK RIGHT AFTER THIS, Pat reveals the highs and lows of the life of a radio and TV broadcaster, spent sharing the mic with the world's rich and famous while battling an infamous public scandal and demons that nearly killed him. With laughter, tears and miracles he reveals how he learned to accept his mistakes, find redemption and become the father he never had, proving there really are second and even third acts in life.